» So you want to Windsurf? » Where can I go to learn? » What sail types suit a beginner? » What other equipment do I need? » Don't forget about Insurance! Whether you're into racing, radical wave sailing or just gently pottering about on your local lake, windsurfing is all about fun. There's nothing like skimming across the water at 30mph to give you an adrenaline rush! But it's not all about speed. With your feet mere inches from the water's surface, face speckled with spray, every muscle and sinew working in unison with the board and rig, it's just you and the elements and your kit; no phones, no fax machines, and no appointments except for the next tack or gybe. Sheer joy, and sailing in its purest, rawest form. It's a great stress reliever and a sport that ANYONE can do and enjoy, no matter what their age or level of fitness. It's also a very friendly sport, and no one cares how good you are, although the theory is that if you don't end up in the water you're not trying hard enough! One of the main attractions of windsurfing is its enormous diversity and the challenges it offers to all levels of sailor. Whether you're 8 years old or 80, taking your first precarious steps on a beginner's board or preparing to initiate yourself into the high speed thrills of performance short?boarding, the sense of achievement is unsurpassed. Don't you need to be strong? While committed fanatics aspire to the high speed wave-slashing aerial antics of the experts, you don't need the athletic prowess of a decathlete or the body of a Greek god to enjoy windsurfing. Technique plays a greater part than strength, and it's a well known fact that women and children make better pupils than men. It is only at top level that strength becomes a deciding factor. High technology equipment also plays a large part in making life easier for the beginner. Today's boards and rigs are much lighter and more efficient than their forebears. Beginner boards now weigh as little as 12kg, and you no longer require a course of steroids to haul them down to the water. Sails are available in all shapes and sizes from two to ten square metres, and it's simply a question of selecting the size that suits you and the prevailing conditions. We've met all sorts while windsurfing, including someone who had just had a hip replacement and another who had recently undergone a triple bypass! The majority of novices will learn to sail in the relatively safe confines of a lake or reservoir, but once the basics are mastered, for many the attraction of poodling peacefully around a pond on a plank soon wanes. Fortunately, there is ample opportunity for fledgling windsurfers to expand their skills and progress to the delights of stronger winds, shorter boards, and discover the adrenaline-pumping environs of waves, speed, and competition. Without doubt the best place to start windsurfing is at an RYA listed centre, many of which are inland in the UK and listed on WaterTrader (www.watertrader.co.uk/RYA). Alternatively, you can call the RYA on +44 1703 627400 for information on an RYA listed centre near you. They also have accredited centres at many locations around the world. A beginner's course in the UK will set you back around £50, but it's well worthwhile. You will learn the fundamentals of windsurfing, including tacking, gybing and much more. Courses tend to start off on a land simulator, where you will get the feel for the way the board moves without having to worry about getting wet! Mind you, with today's equipment, getting wet is a lot harder than it used to be, and learning has never been easier. Most RYA schools use the latest 'widestyle' design of boards such as the HiFly Revo and Magnum, which offer masses of stability and mean you spend more time sailing and less time in the water. 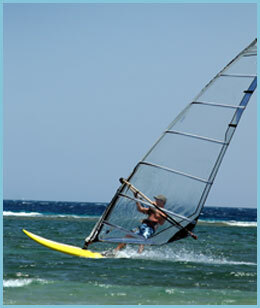 Some schools even guarantee to have you windsurfing within an hour, or your money back! Like most people who try windsurfing you'll probably find that you very quickly get hooked on the sport and just can't get enough of it. This is when you discover that windsurfing is a naturally competitive sport; the immediate goal of most is to learn how to sail faster and faster. Indeed, it isn't until you've sailed a board at planing speed that the full potential of the sport is realised. Although most of Britain's windsurfers sail purely for recreation, one of the quickest ways to improve your sailing is to enter the racing circuit. You can start at local and interclub level and progress upwards through the UKBSA (United Kingdom Board Sailing Association) inland championships, the BWA (British Windsurfing Association) and BSA (British Speed Sailing Association). Not everyone wants to race though, so you'll be relieved to hear that it's not all about competition. Many people join an association or club for the social scene and general camaraderie, and race just for the hell of it. Whatever you go for, you'll have a blast! What size board shall I buy? This will depend on whether you're going to splash out on a brand new board, or intend to save a few quid and opt for an older second-hand model. Most of the shops featured on the WaterTrader site will sell both, but there are a few things you need to know before you decide what's right for your needs. 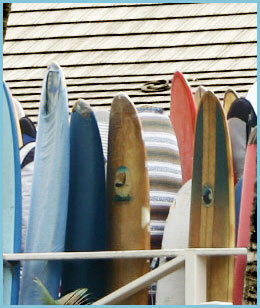 Not so long ago boards were categorised primarily by length, and grouped into classes. 'Long boards' of 340 - 380cm with daggerboards and volumes of 170 - 240 litres were generally either course racing or beginner boards. Next came 'mid-length boards' of 310 - 340cm, which were usually referred to as 'funboards'. These also had daggerboards to offer the wobbling intermediate a bit more stability and upwind performance, and were often used as a stepping stone to the windsurfing holy grail of 'short boards'. They were around 260 - 295cm long, 85 - 110 litres in volume and required waterstarting skills to enjoy. Below this came wave boards, which could be anything from super radical 240cm, 60 litre asymmetrics to floatier but still 'sinky' 260cm, 80 litre models. Definitely for experts only. The beginner's learning curve was thus broken into distinct stages, with each stage involving the purchase of a different board. First, you bought a big, floaty long board to learn the basics of light wind sailing. When your skills had improved enough you'd buy a smaller 'intermediate' board which still had a dagger board and was uphaulable, but could handle much stronger winds and planing speeds. Then, as soon as you had mastered waterstarting and honed your gybing skills, you'd go for a short board for ultimate high speed, strong wind fun. Today, with the recent developments in design and technology, this has changed out of all recognition. The new 'widestyle' boards offer hitherto unheard of levels of stability and user-friendliness for their length, but are still much more responsive and manoeuvrable than their longer counterparts. A well-chosen widestyle board will see you through the learning stages and way beyond, allowing you to learn the full range of windsurfing skills without having to shell out on a new board when you feel confident enough to try sailing in stronger winds. Although you'll still see manufacturers quote a board's length in adverts, the concept of categorising boards purely by length is now completely out of the window, and can no longer be used as a criterion when choosing a board. Often, in a magazine test the most stable, highest volume board is also the shortest! Sounds confusing? It needn't be. Just remember that, when you're starting out, as far as new boards go it's the volume and width that are the important factors, not the length. A board with this kind of volume would traditionally be around 370cm (a "long" board) with a retractable dagger board for extra stability and upwind performance. As intimated above, its modern equivalent would possess the same amount of volume, but be considerably shorter at around 320 - 330cm. For example, the HiFly Revo used by many teaching schools packs an amazing 240 litres of volume into just 335cm, creating a much wider and more stable platform for learning. Also, because it is short it's still very easy and responsive to turn. As we said, windsurfing has never been so easy to learn! If you're on a tight budget, however, don't be put off buying an older design of long board. They're fine for learning and there are some real bargains to be had, but we'd suggest that you avoid buying from private sellers unless you really know what you want. All the shops featured on the WaterTrader site can give you invaluable advice to help you choose the board that's right for you and your wallet. Some dealers will even offer to "buy it back" when you are ready to move onto something smaller and more manoeuvrable. The weight of the sailor makes a great deal of difference to correct board choice. Lighter folk (65kg and below) will be better off with less volume in their board, otherwise they will find it unresponsive, and more difficult to control as the wind gets up. (This is particularly important for youngsters.) Conversely, the heavyweight sailor (in windsurfing, 'heavyweight' is usually taken to mean over 75kg) should be looking for even more volume in their board. More volume = more flotation and more stability. What sail types suit a beginner? There's a bewildering choice of designs on the market, and some of the specialist models can leave your wallet looking decidedly battered, but for the beginner perfectly adequate sails can be found among the cheaper 'recreational' ranges with no need to go to the £300+ type of sail until you reach the level of expertise that demands Porsche style excellence and prices! The simplest kind of sail (often favoured by windsurfing schools) has no fibreglass battens to support it. Consequently it is light for learning, but soon loses its shape and becomes unstable when the wind picks up. A sail with battens is more powerful and stable - full length battens are used to support extra area in the bottom (foot) and side (roach), and if there are five or more can transform the sail into something that performs like a solid wing. Most of these sails with full-length battens are called 'rotationals' because the luff tube rotates around the mast, allowing the sail to set on the leeward side where it is aerodynamically more efficient. The best sails to learn with are probably 'soft' sails which have a full-length batten supporting the top and bottom, with shorter leech battens in between. They tend to be lighter and more manoeuvrable than fully battened rotational sails, and are thus easily handled if it's not too windy. When buying a second-hand package you will often get an entire board and "rig" for just £150. Apart from the sail, the components of a "rig" include a mast, a mast-foot, uphaul rope, sail and boom. The mast fits inside the luff tube of the sail. Standard length masts are 465cm, and the most popular are made of a composite mix of glass fibre and carbon. There are masts on the market which feature large amounts of carbon, but these are aimed at the high performance sector, are extremely expensive and not really suitable for beginners. This fits in the bottom of the mast, and is connected to a rubber or mechanical universal joint (UJ) which connects to the board's mast track. 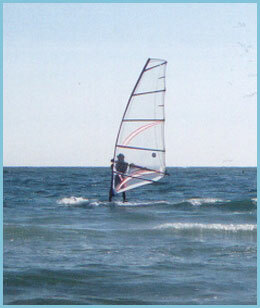 The UJ allows a rig to be inclined at any angle, and it is this device that endows a windsurfer with the unique ability to steer by manoeuvring the rig. The mast base may also include an adjustable mast extension, or one can be added if the mast proves to be too short for the sail. The boom is made up of two wishbone shaped aluminium tubes with moulded plastic end fittings. The front end fitting clamps to the mast at around chest/shoulder height, and the sail is then attached to the boom's rear end with a length of rope, or 'outhaul' line, which can be adjusted as necessary to alter the trim of the sail. 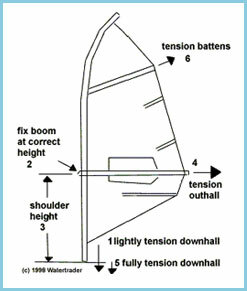 All booms today are adjustable in length so that they can be used with different sized sails. If you're buying second-hand, avoid the older style booms that you have to tie on to the mast. Always go for a clamp boom - you owe it to yourself! So you've got your rig, now what? Rigging to perfection is an art in itself! You may want to seek advice of your dealer or other friendly windsurfer to begin with as rigging does vary depending on your equipment. However, here's our simple step-by-step guide! Wetsuit Even in the hottest of British summers, sailing without a wetsuit can be dangerous. Wind chill combined with repeated immersion in the water can rapidly lower body temperature, which in extreme cases can lead to hypothermia. It's important to choose the right suit for the season. For summer use, you can get away with a relatively thin neoprene suit, but for colder weather a thicker winter suit is essential. Whatever the season, the best wetsuit to buy is a one?piece 'steamer' rather than an old?fashioned long?john and bolero jacket. 'Steamers' are so called because they feature a watertight 'blind stitch', and are consequently the most expensive. Suits that have an 'overlock stitch' are cheaper, but will let small amounts of water flush through every time you fall in; useful on very hot days to help keep you cool, but not so good for colder weather. The most important factor is the fit, so be sure to try on a good selection before you buy. Make sure the suit isn't too tight or too loose, especially at the neck, wrist and ankle seals. If it's too tight it can cause muscle cramps; too loose and it will let too much water in and you'll lose heat. Although a wetsuit will provide you with extra flotation, in the early days of learning buoyancy aid does wonders for your confidence as well as providing an element of safety. On some inland waters you're not allowed to sail without one. Unless you're lucky enough to sail from a sandy beach, a pair of rubber soled neoprene boots or rubber surf slippers are essential to protect those tootsies. Prices vary from £7 to £40 depending on the level of protection. Gloves aren't necessary unless you plan to sail in very cold weather, and even then many sailors find that they make gripping the boom hard and tiring work for the forearm muscles. If you do intend to continue sailing into the autumn/winter months though, we recommend that you go for a glove that is thin and flexible yet still warm, or try an open palm glove, which features a cut-out section in the palm to maximise grip, but still offers protection for the fingers and back of the hands. The windsurfing harness has a hook positioned about waist height that lets you hang from a line attached on either side of the boom. It offers tremendous advantages for more experienced windsurfers, since it allows you to take the strain of holding onto the sail in stronger winds with your whole body, not just your arms. However, the harness is not necessary for beginners. It's pointless using one in light winds, and you shouldn't attempt to sail with one until you've learnt to handle a board confidently in moderate and fairly strong winds. When that time comes there are a variety of styles available - chest, waist and seat harnesses, but the seat harness is the most popular, being comfortable and offering a good degree of support for the lower back. There are now models on the market designed specifically for women and children. Windsurfing is very much a portable sport, and there's an unparalleled choice of sailing venues all over the UK to check out, so you're definitely going to need a good quality roof rack and a set of sturdy straps. There are plenty of roof racks on the market, but we'd suggest that you avoid the cheaper brands as they're not really designed to cope with the loads imposed by a roof full of boards travelling at 70mph. The racks on a car roof must be positioned as far apart as possible. The board is best placed deck down with the nose pointing to the front of the car. A second board can then go on top, and with care four 370cm boards can be carried safely on a small family car. Do make sure that the rack and rack straps are correctly fastened. Every year there are accidents with racks and boards coming off car roofs, so tighten the rack properly and yank those straps down good and hard! Never, ever use bungee cords! If you don't like the idea of putting wet and sandy kit in your car, there are plenty of purpose-built top boxes on the market. These simply bolt to your existing roof rack and allow you to store your sails and booms inside with the boards on top, offering both security and safety. If you own a board, you should also own insurance - 3rd party at least to protect yourself and anyone you might inadvertently run into. (You get automatic free 3rd party insurance if you join the RYA). Comprehensive cover for windsurfers is reasonably priced and well worth considering, since most countries suffer from a certain amount of board/equipment theft, particularly from car roof racks. Check the classifieds at the back of BOARDS magazine for the telephone numbers of specialist insurers, but be warned that most companies will only insure against theft if your board is locked to the roof rack. » I’m a Little Nervous, What Should I Expect? » What kind of Surfboard? » What's the Best I can expect? » What's the Worst I can expect?